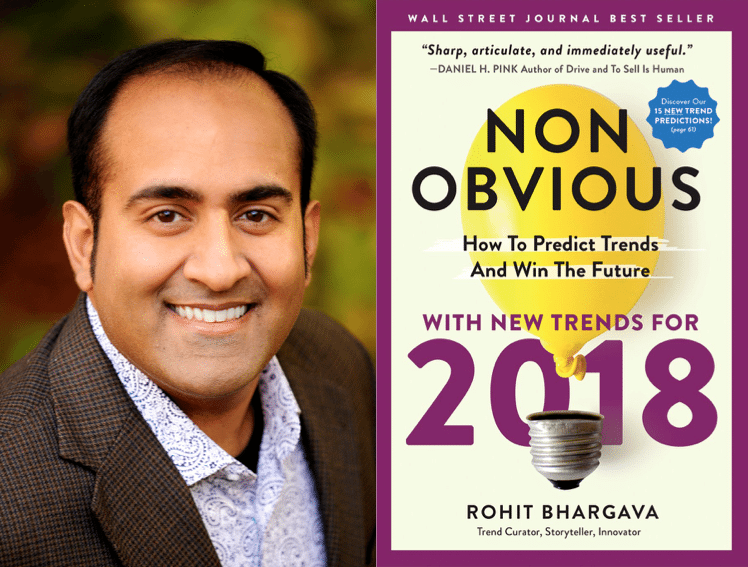 For the 156th episode of The Marketing Book Podcast, I interviewed Rohit Bhargava, author of Non-Obvious 2018 Edition: How To Predict Trends And Win The Future. For the past 8 years, marketing expert and Georgetown University Professor Rohit Bhargava has curated his best-selling list of non-obvious trends by asking the questions that most trend predictors miss. It’s why his insights on future trends and the art of curating trends have been utilized by dozens of the biggest brands and organizations in the world like Intel, Under Armour and the World Bank. In total, the Non-Obvious 2018 Edition features 15 all-new trends across 5 categories including Culture & Consumer Behavior, Marketing & Social Media, Media & Education, Technology & Design plus Economics & Entrepreneurship. The book also features a detailed section with a review and rating for more than 100 previously predicted trends – with longevity ratings for each. The simple aim of this book is to teach you how to notice the things that others miss. I call this “non-obvious” thinking and learning to do it for yourself can change your business and your career. The context within which I’ll talk about this type of thinking is business trends. For better or worse, most of us are fascinated by trends and those who predict them. We anticipate these predictions as a glimpse into the future and they capture our imagination. There’s only one problem–too many trends are based on guesswork or lazy thinking. In other words, they are obvious instead of not obvious. This Book was inspired by the landslide of obvious ideas we are surrounded with and our desire to do something better with them. In a world where everyone is one click away from being a self-declared expert, learning to think differently is more important than ever. Observing and curating ideas can lead to a unique understanding of why people choose to buy, sell, or believe anything.